The most shocking results of the data is that of wearable users with sleep apnea and of those with atrial fibrillation which both are far greater than the US average reported by the Center for Disease Control and Prevention. For sleep apnea, the data shows almost double the average. Atrial fibrillation is even higher, almost triple as much. 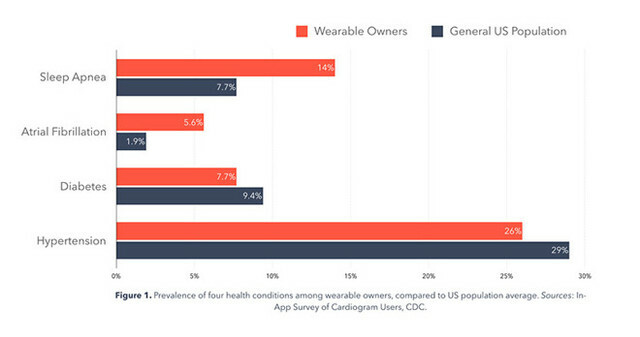 Overall, more than a quarter of Cardiogram users report having at least one chronic health condition. Last year, the Health eHeart Study concluded the heart rate sensor in the Apple Watch – when paired with Cardiogram and UCSF’s DeepHeart neural network – is 97 percent accurate at detecting abnormal heart rhythms.